Need email marketing software? Our 33 page review pack can help you choose. Interestingly, we’re finding that software vendors are buying the report for competitive intelligence reasons. They aren’t our primary audience – we focus instead on SMBs looking to buy software – but it is encouraging that they see the value of an independent perspective on how they and their competitors compare. 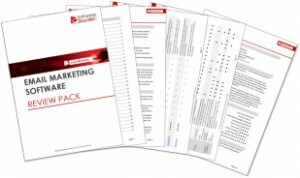 To find out more about the review pack, or to buy yourself a copy, visit the Email Marketing Software Review Pack page on our website.